A friend was in Florida, and as people in Florida are wont to do, he taunted me with pictures of some good birds that I am not currently looking at. In this case, it was especially cruel because he posted a Limpkin, a bird I have never looked at. Another commenter asked the obvious, yet seldom-addressed, question: “Man, what do you have to do to an ornithologist to get called “limpkin”?” I didn’t know, so I made the obvious American Woodcock joke and the world kept turning. But the question has continued to haunt me. Finally, I was forced to do actual research. And the answer, sadly, is what we all suspected: you don’t have to do much of anything except walk funny. It’s just that simple. 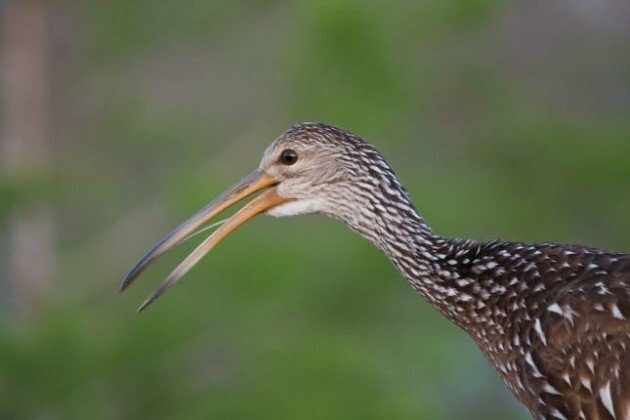 The Limpkin, it seems, is so called for its gait, described variously as “jerky” or “mincing”. Or “slow and strolling”, because Sibley always likes to confuse the issue. Either way, not cool, guys! Not cool. Of course, the term dates from the 1870s, when many things were not cool. But as vernacular, I have to say that it’s down there with Fool Hen. Because of its calls, the Limpkin is sometimes also called the crying bird – also not a name you can take to the playground with impunity. So maybe some reckless member of this really quite attractive and fascinating species actually did do something untoward to some long-forgotten birder. Steal his girlfriend? Poop on his hat? The investigation continues. I always enjoy these entries. I’ve been wondering about this word for a long, long time. The standard etymology limp + -kin doesn’t make much sense to me: by the time this word is attested, -kin wasn’t a productive suffix in English any more, and the bird limps no more than any other long-legged wader. My suspicion is that the word was produced by folk etymology from an aboriginal name, but I haven’t been able to prove it yet. Keep an eye out in your reading, and maybe we’ll come across the smoking gun.